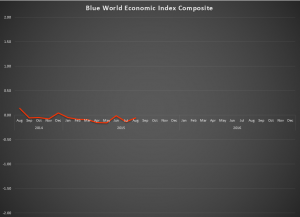 The Blue World Economic Index™ remains fractionally negative for August 2015 at -.06.vs a -.14 in July. Three out of the eight major categories were negative including Employment, Inflation and Manufacturing while Real Estate made it back above zero for the month joining General and Consumer measures, Services and Retail Sales. We’ve been asked why Inflation is receiving a “negative” index assignment when it is so low. It is true that rising inflation can be the enemy of growth but when it runs too low for too long it is more an indication of weak demand as has been the case now for several years. We don’t want to see run-away inflation develop but some steady pricing pressure to indicate growing demand would be a welcome change. We continue to believe a rate hike is not imminent and the Fed will require a great deal more evidence of strengthening. The markets don’t like the headline at time of writing, and there could be a few reasons. They might perceive the headlines to be a positive for the economy (which should obviously cause the markets to fall) and think it makes a rate hike more likely. They might think it’s a negative, and therefore signaling a still weak economy. They may view it as good enough to make a rate hike likely but bad enough to signal continued weakness…ughhh. The psychology of the “experts” is an endless exercise in intellectual masturbation. For those of us running real businesses and trying to employ real people there is no indication of significant change in either direction. The labor market remains weak and our decisions must remain cautious. The unemployment rate is unchanged at a fraudulently low 5.3%. We’ve been explaining that this is caused by a phenomenon where the number of employed people is rising much faster than the number of those entering/re-entering the civilian labor force. We’ve shown that graph over and over, but we decided to take a different approach today. We are posting a table showing the percent changes in some key metrics since January of 2011. We admit even we were startled at the results. A couple of positives did show up for July of 2015, including some spotty bounce-back in sector wages and a strong diffusion index in manufacturing at 57.5. Unfortunately the latter is in disagreement with most manufacturing sector data from the past year, so let’s hope it signals an uptick in other manufacturing data going forward. 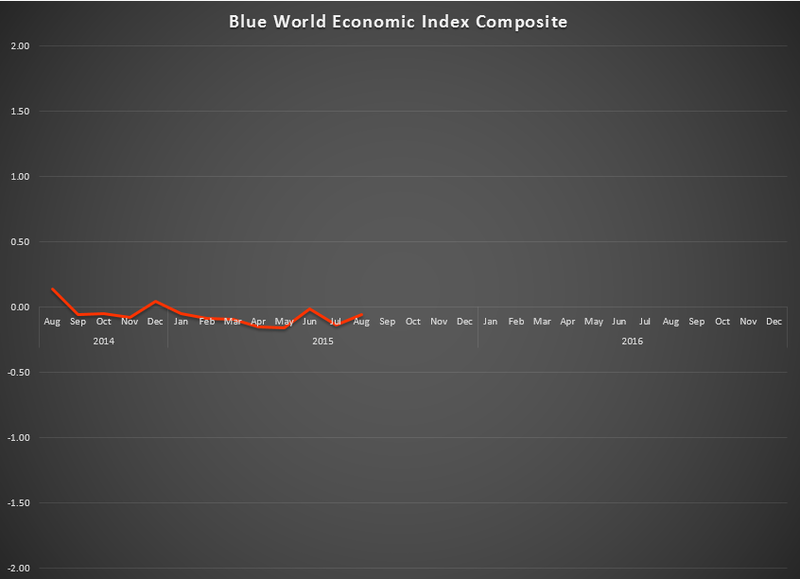 Follow the Blue World Economic Index™ for more information. Below is the table we mentioned showing percent changes in a few key metrics followed by Blue World as well as the Fed as they consider monetary policy. The weakness is striking and may illustrate why the unemployment rate is so misleading even better than the graphs. The next jobs report release is scheduled for Friday, September 4th. Our written report will be out in the morning and Matt will be analyzing it live on WBBM Chicago AM780 and 105.9FM at about 12:10 Central. Look for the next Blue World Economic Index™ report on Monday, August 31st. Have a great month, everyone.